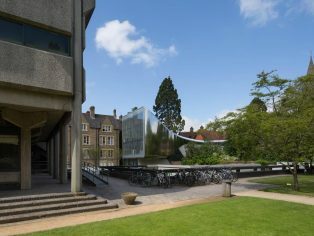 Founded in 1957, the Middle East Centre at St Antony’s College serves as the University of Oxford’s facility for research and teaching on the Arab world, Iran, Israel and Turkey from the 19th century to the present day, with its focus on the research of humanities and social sciences. The centre has been housed at 68 Woodstock Road (the former rectory of the Church of St Philip and St James) since 1978. The Middle East Centre holds Oxford University’s primary collection on the modern Middle East, a world-class archive of private papers and historic photographs used by scholars and researchers with an interest in the region. The centre’s research core is the specialised library, document and photographic archive covering material from the 1800’s onwards. The archive was set up in 1961 and has grown to over 400 collections of private papers and holds more than 100,000 historic photographs. The new Investcorp Building for the Middle East Centre provides 1,127 square metres of additional floor space and a new 117-seat lecture theatre; doubling the space available for the Middle East Centre’s expanding library & archive, and providing optimum conditions to conserve and manage the centre’s collections that were previously stored in the basement of 66 Woodstock Road. As an integral part of the college’s on-going expansion plans, the Investcorp Building incorporates essential new facilities to meet the Middle East Centre’s increasing demand for research and academic activities. The need to expand the teaching space at the centre has become increasingly acute with student numbers growing dramatically in recent years, including many additional masters’ students and doctoral candidates. The new lecture theatre will allow the Middle East Centre to expand its popular programme of seminars, lectures and debates – much of which is open to both the University and the general public. The Invescorp Building complements the college’s ongoing development. Its design weaves through the restricted site at St Antony’s College to connect and incorporate the existing protected buildings and trees; while its stainless steel façade softly reflects natural light to echo the building’s context. The building integrates new academic and research facilities within a design defined by the existing built and natural environment of the college. The project maintains the detached character of the college’s current buildings, allowing them to be read as separate elements, while introducing a contemporary building that conveys the past, present and future evolution of the college, university and city. To the west, the project’s scale defers to the existing buildings of 66 & 68 Woodstock Road. The curved form of library reading room’s western façade accommodates the century-old Sequoia tree and its extensive root network; while a drainage system has been installed below the foundation slabs to ensure the tree receives enough moisture. To the east, the archive reading room and librarians’ offices rise towards the height of the 1970 brutalist Hilda Besse Building it faces, yet the new Investcorp Building remains below the roofline of the adjacent 66 Woodstock Road. The 117-seat lecture theatre is located below ground and is ventilated through a thermal labyrinth. A similar labyrinth exists beneath the library archive room to achieve the essential environmental controls and mitigate the need for mechanical air-handling. A ground source heat pump provides active ground coupling controlled for both temperature and humidity, creating a secure environment to conserve the centre’s renowned collection. The work of the Middle East Centre contributes to the global discourse and greater understanding of the region. The new Investcorp Building connects disparate buildings within the college, defining a series of spaces for the centre’s renowned archive, library and seminar programmes; allowing the Middle East Centre to expand its commitment as a vital forum of research, understanding and open debate.